A Sami bracelet is perfectly sized when you measure your wrist tightly and add 1 cm / 0.39 inch to your wrist size for narrow and medium. For wide bracelets add 1,5 cm / 0.5 inch to your wrist size. 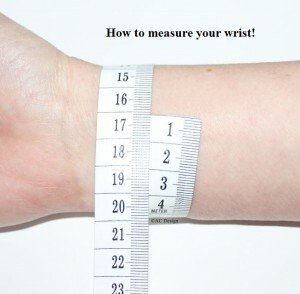 Always follow the specific measure instructions given with each bracelet! If you are between sizes ask yourself how you like to wear your bracelet. If you wear it tightly choose the smaller size and if you like to wear it loosely take the next size up.Please be aware that when you receive a new Sami bracelet it can feel a little stiff, but the bracelet will quickly soften and become more comfortable as you wear it. You can also measure a Sami bracelet you already have. You should measure leather end to leather end (not including loop) for the correct size. 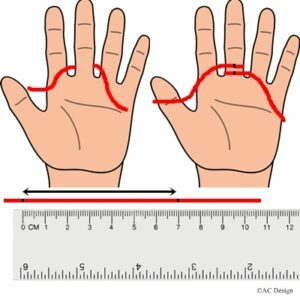 Measure around the base of the finger to be sized. Cut a strip of paper or a piece of string. The paper should be no wider than 1,5 cm / 0.59 inch and about 10 cm / 4 inch long. Wrap the paper or string around the base of the finger to be sized. Make sure the measurement is snug, but not too tight. Measure with a flexible tape-measure either above or below the ankle bone. If you held the measuring device snug, then add 1 cm-1,5 cm / 0.39 inch – 0.5 inch, depending on how loose you want your anklet. Determine the necklace length that best suits your style. Copyright©AC Design 2001-2019. All Rights Reserved.